We are now accepting applications for the 2019-2020 As Fresh As It Gets Awards. Please submit your application by Monday, April 15, 2019. Why should you apply for a San Mateo County: As Fresh As It Gets Award? Each Award Winner will receive a San Mateo County: As Fresh As It Gets Award Certificate, an Award Plaque for display at their business, and a commemorative polo shirt, as well as commendations from their respective local, state, and federal government officials. Additionally, Award Winners have the opportunity to have their chefs promoted in profiles (including an image and a brief biography) on our Meet the Chefs page and are able to join the San Mateo County/Silicon Valley Convention and Visitors Bureau at a discounted rate. Find more information on Bureau Partnership here. 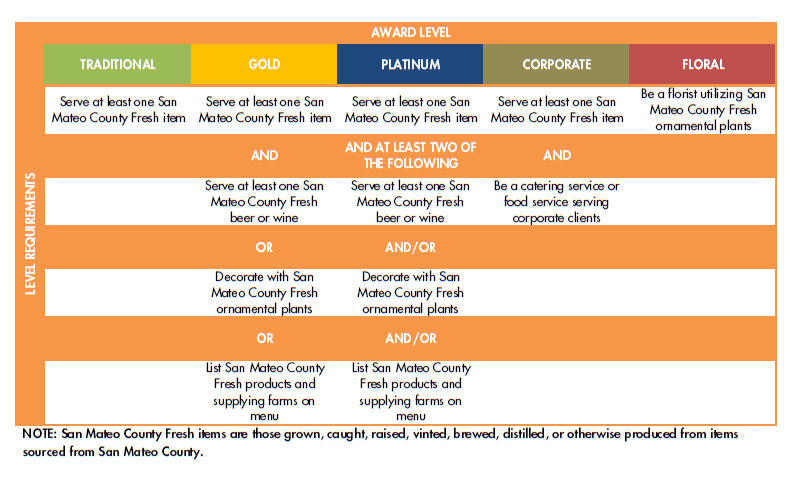 Is your business eligible for a San Mateo County: As Fresh As It Gets Award? Find out below! If your business has won an award in the past and still qualifies this year, remember to renew your application for this year&apos;s awards ceremony. Please download the online renewal application and follow the instructions above. Not Eligible But Want To Be? Contact Nova Maldonado at nova@smccvb.com or call 650.348.7600 for more information on local producers and to sign up for our As Fresh As It Gets mailing list.